Without question, ageism exists in biotech. 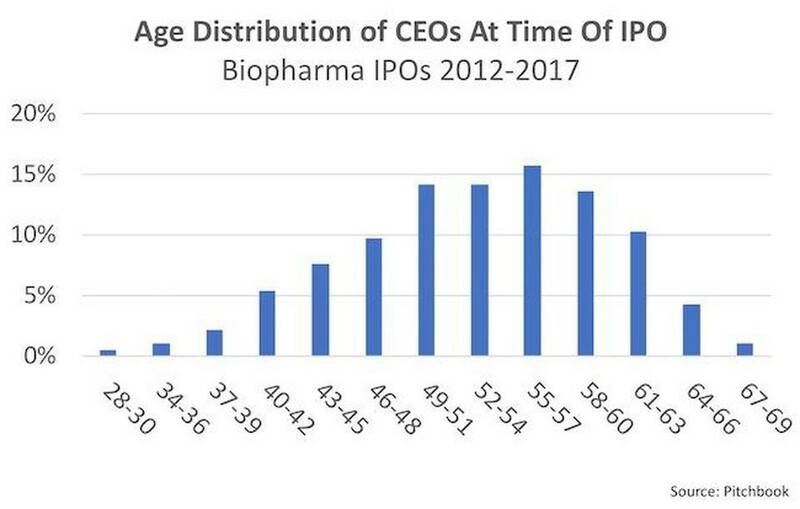 Recently, a feature in Forbes (Gray Hair in the C-Suite: Experience, Age and IPOs in Biotech) highlighted that the median age of biopharma CEOs at IPO was 54 years, and 75 percent were 48 or older. I’ve experienced ageism. At 37 years, I am more than 15 years younger than the median biotech CEO. The average age of first-time CEOs at IPO is 51. While this should be surprising to no one, it does beg the question of whether age has bearing on one’s ability to lead a company to a successful outcome. I raise the question here because there are strong parallels to academia. University labs are for most intents and purposes ‘small companies’ with equivalent budgets and comparable organizational structures. The principal investigator of an academic lab holds an equivalent position to the CEO of a company, and challenges securing ones first “faculty” position, startup and ongoing funding, and strategic partnerships are identical to those faced in business, particularly as they relate to age and experience. To be clear, I am not disputing that experience matters – the questions I am interested in deconstructing are ‘is age a proxy for experience?’, ‘is experience a proxy for performance?’, ‘how much do either age or experience matter in leading a biotech company?’ and ‘in what contexts do they impact outcome?’. In Gray Hair in the C-Suite: Experience, Age and IPOs in Biotech Bruce Booth extends the work of Katrine Bosley to elaborate on the question of whether age matters by introducing more data into the conversation. 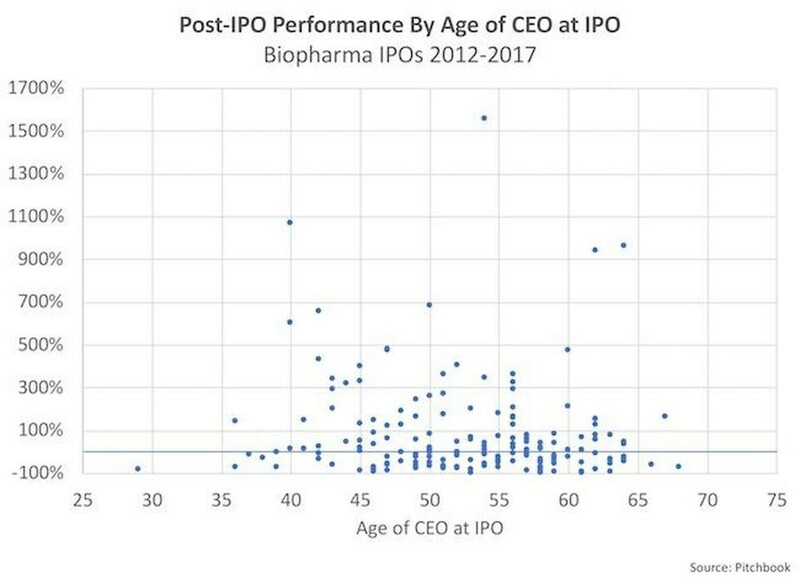 Among the data shared is evidence that post-IPO stock performance has no correlation with CEO age at IPO in biopharma, and performance doesn’t change relative to the founding status of the CEO. Similar studies have found no statistically significant relationship between long-run aftermarket performance and director experience at the time of an IPO, and no material patterns have been observed between CEO age and subsequent abnormal shareholder return performance. Where then is age relevant? Mr. Booth appropriately notes that if the median time to IPO is six to seven years, the typical founding CEO must have been in their mid-40s when they started the company. Founding CEOs in their mid-40s at IPO would presumably have been in their mid-to-late 30s. Non-founding CEOs are generally older. This is comparable to the median age of first assistant professor position in academia, which is typically related to acquiring one’s first RO1 grant from the National Institutes of Health in the United States (an equivalent of seed funding in biotech, see Future of fundamental discovery in U.S. biomedical research). 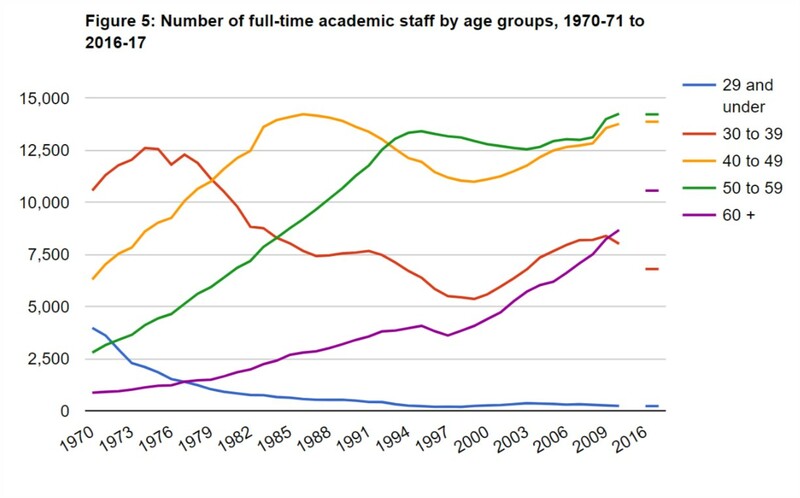 Statistics are comparable for Canada, and reinforce a trend of increasing age of full-time faculty (Figure 5, below). Since academic labs are always founded around an assistant professor, who is never replaced as the director of the lab, founder-CEOs are the closest comparator. While these data reinforce the observation that investors want to back directors who are older, it doesn’t address the fundamental question of whether age is a proxy for success. The common narrative that is often advanced (without data) is that younger CEOs, like junior faculty, lack experience in leadership that introduces management risk to an already risky venture. More experienced directors are therefore “likely to be better at R&D risk identification/mitigation strategies and appropriate resource allocation; further, they will typically bring value-added broader networks, built over their careers, into pharma decision-makers and the capital markets to leverage for downstream liquidity” (Gray Hair in the C-Suite: Experience, Age and IPOs in Biotech). My next post will explore a different narrative.